I've seen those stories too. 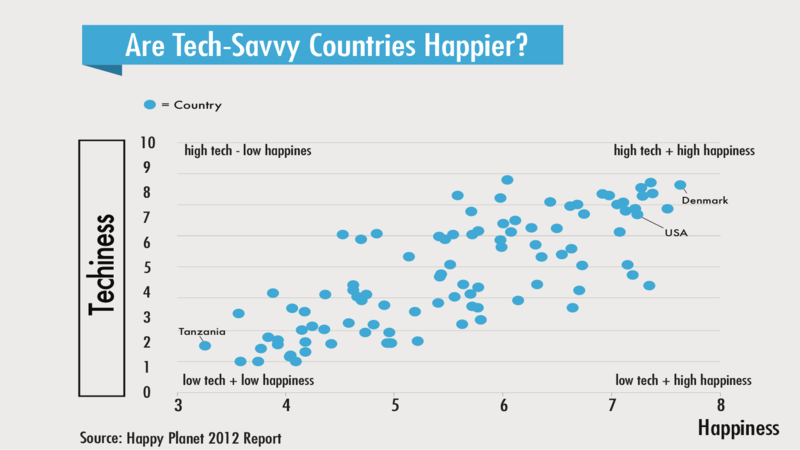 But what they don't mention is that tech is actually contributing to our happiness. This week's Evidence of Abundance focuses on how technology is changing our quality of life. The following graph comes from a 2012 report called "Happy Planet." 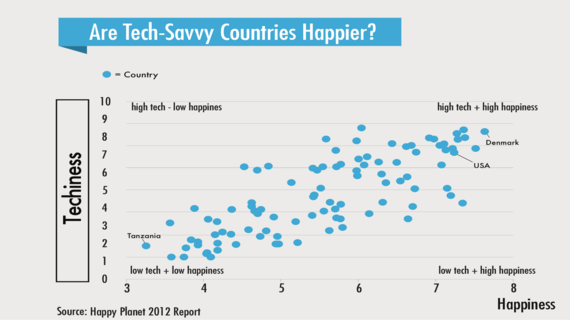 It shows the degree of happiness in various countries according to their use of technology. On the low-tech, low-happiness end of the spectrum, you see Tanzania. And on the high-tech, high-happiness end of the spectrum, you see the U.S. and Denmark, which is one of the happiest tech-savvy countries on the planet. Regardless of what the naysayers believe about human interaction and social media, the data show us that the abundance of technology is actually increasing the abundance of happiness all over the world. Here's an accompanying video blog for this Evidence of Abundance. Please send your friends and family to AbundanceHub.com to sign up for these blogs -- this is all about surrounding yourself with abundance-minded thinkers. And if you want my personal coaching on these topics, consider joining my Abundance 360 coaching program for entrepreneurs.